Aquarium filters helps keep the tank’s water clean by removing harmful waste and chemicals. However, aquarium filters are not a replacement for regular weekly water changes. The clean water that gets flown back into the aquarium also helps with water circulation and helps keep the oxygen level up. Although most fish owners also need to compliment their filter with an air pump to supply enough oxygen. Aquarium filters are able to provide three types of filtration: mechanical, chemical and biological filtration. All types of aquarium filters have a mechanical and biological filtration process. Some will have the option to add additional media for chemical filtration. Mechanical Filtration — Where water is filtered through the foam or sponge media and the debris and/or particles are trapped from reentering back into the aquarium’s water. 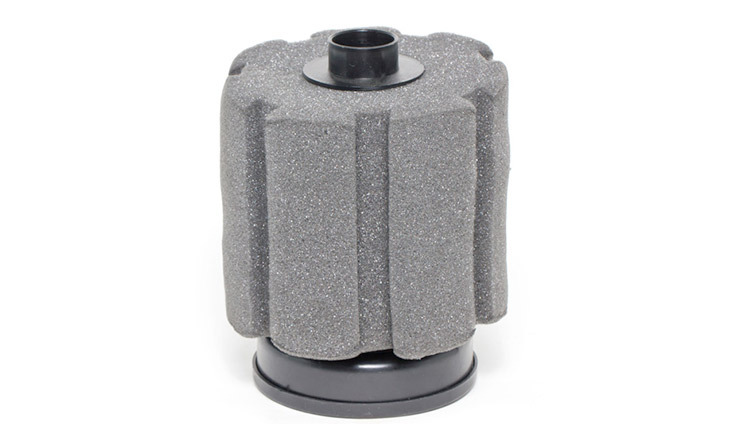 Replace the foam or sponge media regularly to allow your filtering system to run effectively. Chemical Filtration — Toxic chemicals is filtered through resin or media. Different types of chemical filtration will target specific type of nutrients or chemicals found in your aquarium’s water. Activated carbon can also help eliminate odors and ammonia. Chemical filtration isn’t necessary to maintain clean water but it can help it clean more efficiently. Without carbon filtration, you might have to perform more frequent water changes to maintain sparkling clean water. Biological Filtration — Helps breakdown different types of bacteria. With the proper media, you’ll be able to introduce bacteria that helps consumes ammonia. 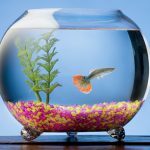 Use our list as a guide to choosing the right aquarium filter for your specific needs based on type of fishes your have, aquarium size and budget. We include the pros and cons of the different types of aquarium filter options. Sponge Filters are often very affordable and easiest to use. Although not normally recommended as the main filtration system. They’re an ideal choice for Guppy and other smaller sized fishes since small fish don’t create a lot of waste. 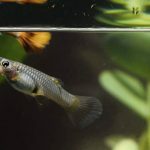 Since their filtration intake isn’t as strong as the other aquarium filter types, small fishes, fry and small invertebrates won’t get caught in them. They typically come in a very simple design — an enclosure containing a sponge that is connected to an air pump. Sponge filters are usually positioned at the tank’s bottom with an airline tube upright. 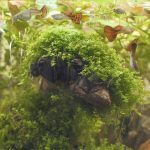 Hobbyist who prefers to create a natural looking habitat might want to look for other options since Sponge Filters aesthetically aren’t very pleasing. Quick and easy to setup. Economical choice. Great for smaller-sized fishes (like Guppies, Platys, etc.) or temporary setups like breeding tanks, hospitality tanks or fry until they need to be protected from filtration’s intakes. Intake isn’t as strong as other options so it isn’t suitable for larger-sized fishes. Aesthetically, it will not please you if you’re looking to build a natural looking habitat. Corners Box filters are one of the most economical types of aquarium filters on the market. They work fairly well for smaller tanks (10 gallons or less). 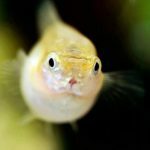 Like Sponge Filters, they’re an ideal choice for Guppy and other smaller sized fishes that don’t create a lot of waste. 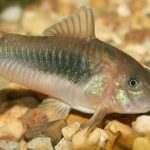 Since their filtration intake isn’t as strong as the other aquarium filter types, small fishes, fry and small invertebrates won’t get caught in them. They are typically designed to sit in the corner of an aquarium tank. Corner Box filters requires the use of an air stone to help pushes air through an airline which in turn powers water through filter floss which filters your water mechanically. The bacteria will build up on the filter floss, helping you biologically filter the water. Hobbyist who prefers to create a natural looking habitat might want to look for other options since Corner Box Filters aesthetically aren’t very pleasing since they look like a box with plastic casing in a corner, filled with filter floss. Intake isn’t as strong as other options so it isn’t suitable for larger-sized fishes. Aesthetically, it will not please you if you’re looking to build a natural looking habitat. Canister Filters are probably one of the most popular types of filter system for hobbyist. By customizing the different types of filters media, you’re able to use it as a biological, mechanical and/or chemical filtration system. They come in a variety of sizes and suitable from a mid sized tank to large setup. They can be used for both freshwater and marine aquariums. Most canister filters have replaceable motor parts and valves, if a part ever needs to be replaced. Since canister filters uses a siphon intake method, they usually operate best when they are below the aquarium water level. Most people place theirs inside the aquarium stand or hidden away in the cabinet. Versatile and suitable for all types of fishes. Customize with various media to suit your needs. Most models runs practically silent if it is hooked up properly. Parts can be easily replaced if broken. Intake can be a bit too strong for smaller-sized fishes, weak fishes or if you have small invertebrates like Red Cherry Shrimp. Can be quite expensive. Power hang-on filters (also known as hanging filters or overflow filters) are usually included with startup aquarium kits or sold separately. They hang off the back of the tank and draws water in through a lift tube and return the water in a water-flow like way. However, they’re not recommended if your aquarium has any fishes that are known to be jumpers (for example Guppies, Four-Eyed Fish, etc.) since it requires a large opening to fit the filter. Not very efficient in filtering. Water can evaporate. The returning water can be quite load. Requires an opening in the aquarium top. They’re typically used for turtle or terrarium tanks. Internal filters can be fully submersed. Since they take up space inside the aquarium, they’re not suitable for use inside small-sized aquariums like 10-gallon tanks. Some hobbyist use it as an additional filter to an existing filtration system to help remove more waste or help circulate the water. Completely submersible. Quick and easy to setup. Takes up space in the aquarium. Can be quite expensive. Not suitable for very small or large-sized tanks. Most Under Gravel Filters are sold with beginner aquarium kits because they are inexpensive and relatively maintenance free. The filter plates goes under your aquarium’s gravel or substrate. An air pump then pushes water through the gravel, pulling particles in your water with it. Under Gravel Filters tends to do a good job at biological filtration. However, they do have a tendency to clog over time, as they’re not strong enough to provide good mechanical filtration. You can prevent them from clogging with frequent vacuuming of your aquarium’s floor to prevent particles from building up. This is a decent option for the beginning hobbyist who does not want to continually replace filtration components. However, keep in mind that Under Gravel Filters does not do chemical filtration. Pretty much maintenance free in comparison to other filters. Don’t have to replace filter components. Does not do chemical filtration. Wet/Dry filters are mainly used by saltwater hobbyist. Although some freshwater hobbyist also uses it for their setup. 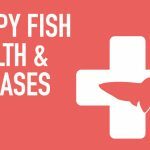 It is a great option for anyone who has a lot of fish. Helps to add more oxygen to your water. Expensive and time consuming to setup.